The holidays are drawing near. Contemporary Christmas celebrations range from close family gatherings to elaborate parties and celebration events. For the early pioneer family Christmas celebrations were very different. Two possible social events were all that pioneers attended. The first event was probably a religious celebration in the rural church, which sometimes doubled as the schoolhouse if the town hadn’t had the time to build a church. In the small community near my home the first church was built in 1913, so services were held in homes or the school prior to church construction. This service usually consisted of singing carols and a re-enactment of the Nativity story with children clad in fuzzy bathrobes and a doll as the Christ child. Sometimes a willing new mother could be convinced to allow her new child to act as “Baby” Jesus. After the service, the participants and guests helped themselves to homemade cookies, holiday breads, and, if available, some fruit punch. The second event was attended by all neighbors and parents in the area. Whether you had children in school or not, you probably attended the one-room school Christmas party. Everyone was entertained by Christmas stories and songs. Each child had a part in the program. Sometimes there would be a play, but mostly the audience was treated to singing. The photo I’ve attached was taken after one such Christmas event. 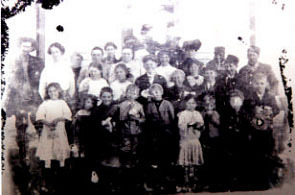 The entire neighborhood was rounded up for a photo after the program. You should note that each child is proudly clutching their Christmas gift—a popcorn ball. In the mountain town of Georgetown, Colorado, the wealthy Hamill family made certain that oranges were brought in to provide a special gift for each child. Whether historic or modern, holiday celebrations have always included close family and neighbors. Last time, we talked about the wonderful, life-saving pioneer cookstove and it’s ability to multi-task as a hot water heater, provider of heat, and all-around food cooking device. We’ve also discussed water supplies for pioneer families. This time I’d like to add a bit more information about the pioneer water supplies in winter. Like all mammals, cows and horses need water in winter’s cold months. If left to fend for themselves, cows or horses will get their water from snow fall, but it is not the best option. If animals were kept close to the homestead dwelling in winter, the homesteader had to devise a way to provide water. Usually this meant getting the water into a water tank or livestock tank in a corral or the “close-in” pasture. If the watering trough was not close enough to the pump, this meant hauling water by bucket or building some sort of piping system to get the water to the livestock. Many homesteaders simply built a ditch to the trough, while others eventually went modern and buried a pipe to get the water to it’s destination. If the water froze in the trough, the homesteader would use an ax to chop the ice (sometimes as thick as six inches or more) to allow livestock to drink. If the piping system froze, hot water from the cookstove reservoir would be carried to the frozen spot in hopes of thawing the system. The frozen water problem could be compounded if a cistern was used for providing water for the house or a “modern” pump had been installed in the pioneer kitchen. At least in the last scenario, the homesteader could remain warm while thawing out the system. Like the other problems and challenges of homesteading, water in winter could be a major hurdle. As a self-pronounced “foodie”, I recently found myself drooling over a modern stove. Six burners and a double oven had my rapt attention. Ahh, for all the modern conveniences. Then reality hit—cooks have been using double ovens and six burners for over two centuries. They were called a cookstove. Pioneer women had it all in the gourmet cooking department. In fact the cookstove also included a hot water reservoir and a warming oven up top. In the pioneer kitchen, the cookstove was the hub of activity. When not in use serving meals, the stove provided hot water for washing clothes and taking baths. Without the blessing of the hot water reservoir, the homesteader’s wife was stuck with trying to heat up enough water in pans to do a week’s worth of dirty clothing which in cold weather cooled off so quickly that half-way through the task the water was cold and miserable. And the Saturday night bath with Dad going first followed by Mom, and kids in descending order of age was less easily accomplished without a reservoir. The back burner of the stove usually held the ever-present coffeepot or teakettle standing at the ready to warm-up chilled children and adults after a trip into the cold weather. Even in hot weather, the coffeepot stood at the ready. The warming oven on top was also a blessing, holding a meal at the ready for a tardy farmer without the drying effects of modern day microwaves. A freshly baked pie tucked in the warming oven made for a delicious dessert after a meal. Other than the use of fossil fuels (a definite no-no in this modern world) the old-fashioned cookstove is looking more appealing everyday. You are currently browsing the Authorsandy's Weblog blog archives for December, 2013.